Jo Darbyshire is the new Chair of Fylde DFAS. 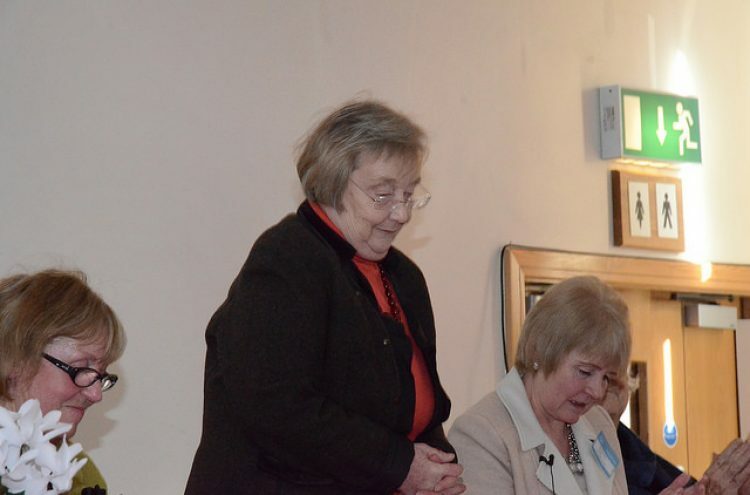 Jo was elected at the Society’s AGM, held on 4 February 2015. Previously the President of Fylde DFAS, Jo is no stranger to our members and we are delighted that she will be continuing to play a large part in the future of the Society. Unfortunately, a new Chairman meant that we had to say goodbye to our current Chairman Marie Riley, who has led the Society for the last 16 months or so. Marie was thanked for the huge amount of work and time she has devoted to Fylde DFAS, not only as Chairman, but also as a hard working committee member. Members were reminded that last year her input was recognised by NADFAS, who awarded her an Individual Marsh Award for Young Arts Volunteering, in recognition of the ‘It’s a Birdie!’ community arts project. Marie is leaving the area for family reasons and we wish her well for the future. We are also delighted to welcome Hugh Elwood as President of Fylde DFAS. Hugh has been a great supporter of our Society since its inception and has contributed in many ways, including lectures at social occasions, in particular our popular DFAS At Night events. Two new members were elected to the committee – Pat Corless and Jacqueline Arundel. Further information on the committee is available here. Photos of the AGM are available on Flickr.